Take the luxury cruise you have always dreamed about on the stunning 1070-guest Crystal Serenity. 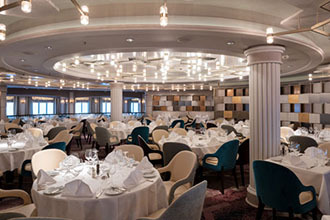 Feel like a VIP as you receive the acclaimed non-obtrusive service of Crystal Cruises, dine on the finest cuisine and retreat to beautiful spacious accommodations. 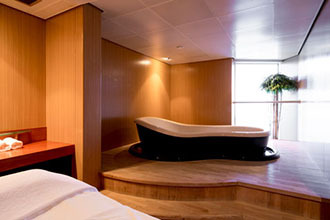 Discerning travelers, this ship is for you! De-stress at the fabulous Crystal Spa as you are pampered with fabulous treatments for the mind, body and spirit. 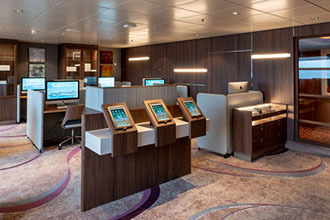 Take an enrichment class at the ComputerUniversity@Sea or a special theme cruise, such as the Crystal Wine & Food Festival at Sea. Shop for a variety of designer items at Avenue of the Stars — this incredible ship has it all. Leisurely days of pleasure means you can finally read that bestseller, so head to the well-stocked library, which also has DVD’s and various board games or relax by the pool. Imagine savoring the culinary masterpieces of famous celebrity chefs. Head to Silk Road, an elegant pan-Asian restaurant and The Sushi Bar, featuring dishes by legendary chef, "Nobu" Matsuhisa. Savor classic Italian dishes of Piero Selvaggi, owner of the famous Valentino restaurants, at Prego, for an unforgettable dining experience. Casual eateries for daytime meals include Tastes, with themed luncheon buffets and The Bistro, a European-styled coffee and wine bar. Enjoy the Lido Café for a quick breakfast and lunch, the poolside Trident Bar & Grill and try Scoops Ice Cream Bar for a delicious treat. Dine under the glow of crystal chandeliers on exquisite cuisine prepared in the classical French tradition with a regional twist, at the beautiful Crystal Dining Room. Boasting menus sure to please the most discerning palate, as well as a separate one with mouthwatering four-course vegetarian dinners, never repeated during a cruise. Convenient Dining by Reservation™ is offered, as well as complimentary in-suite dining. Luxuriate in your spectacular home away from home, with more than 80 percent of all staterooms boasting private balconies, perfect for morning coffee, cocktails and romantic sunsets. TV, a DVD player and Internet are featured in all. Complimentary amenities also include wine and various spirits. 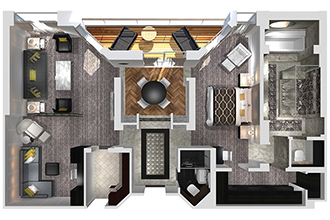 Indulge in the 982-square-foot Crystal Penthouse, with a huge living space and elegant dining area, state-of-the-art audio-visual system and a personal butler, anticipating every need and much more. Exciting evenings await on the stunning ship. If you like dancing, The Gentleman Host Program provides a dance partner for single female passengers, so you will never feel left out. Meet friends for a cocktail at the Avenue Saloon and The Bistro. Enjoy pre-dinner dancing in the Starlite Club and watch a spectacular Broadway-like production at the magnificent Hollywood Theatre. Delightful piano music can be heard at the popular Crystal Cove, ideal for relaxing pre-dinner cocktails. Family fun activities and youth programs are also available onboard. Incredible cruise vacations await on the unparalleled Crystal Serenity. Crystal Serenity cruises to worldwide destinations, including Caribbean, Bahamas, Alaska, Mediterranean, U.S. & Canada, Hawaii, South America, Mexico, Panama Canal and Asia. LIVE & SLEEP- The stylish Deluxe Stateroom includes a well appointed sitting area, queen-size bed or twin beds, sizable wall closet, and private verandah for morning coffee, stunning views and fresh ocean breezes. REFRESH- Your well-appointed bathroom features a full bathtub/shower, ETRO bathrobes, kimonos and slippers, and exclusive ETRO bath products. RELAX- The gracious services of your stateroom attendant ensure your accommodations are always meticulously attended to with twice daily housekeeping and evening turndown service. And of course, 24-hour room service. LIVE & SLEEP- The stylish Deluxe Stateroom includes a well appointed sitting area, queen-size bed or twin beds, sizable wall closet, and private verandah for morning coffee, stunning views and fresh ocean breezes. REFRESH- Your well-appointed bathroom features a full bathtub/shower, ETRO bathrobes, kimonos and slippers, and exclusive ETRO bath products. RELAX- The gracious services of your stateroom attendant ensure your accommodations are always meticulously attended to with twice daily housekeeping and evening turndown service. 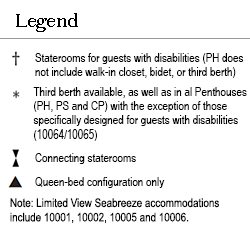 And of course, 24-hour room service.LIVE & SLEEP- The stylish Deluxe Stateroom includes a well appointed sitting area, queen-size bed or twin beds, sizable wall closet, and private verandah for morning coffee, stunning views and fresh ocean breezes. REFRESH- Your well-appointed bathroom features a full bathtub/shower, ETRO bathrobes, kimonos and slippers, and exclusive ETRO bath products. RELAX- The gracious services of your stateroom attendant ensure your accommodations are always meticulously attended to with twice daily housekeeping and evening turndown service. And of course, 24-hour room service. 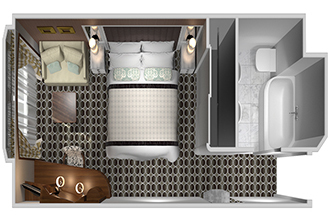 LIVE & SLEEP- The well-appointed Deluxe Stateroom includes a welcoming sitting area, queen-size bed or twin beds, spacious wall closet, comfortable deluxe seating with soft leather sofa, and large picture window. REFRESH- Your elegant, double-vanity bathroom features a full bathtub/shower, ETRO bathrobes, kimonos and slippers, and exclusive ETRO bath products. RELAX- Relish 24-hour room service, twice-daily housekeeping and evening turndown service in your inviting Deluxe Stateroom. LIVE & DINE- Enjoy in-suite dining, socializing or simply relaxing in the comfort of your luxurious living room and separate dining area. A built-in bar, Swarovski chandelier, and custom entertainment center with flat-screen HD TV make you feel right at home. SLEEP- Relax in a luxurious master bedroom that includes a dreamy queen-size bed or twin beds and features you’ll love including his & her walk-in closets, fine Frette linens, television, and private access to the expansive verandah. REFRESH- Soak in the stunning ocean views from the Jacuzzi of your lavish master bath, which also boasts flat-screen HD TV, heated floor and bench, separate shower and bidet, and decadent marble features. A separate guest bath includes shower and discreet entry. RELAX- Extraordinary 24-hour butler service enhances your stay in this remarkable suite. Services include packing and unpacking, in-suite dining, reservations for shore excursions, spa and specialty restaurants and more. 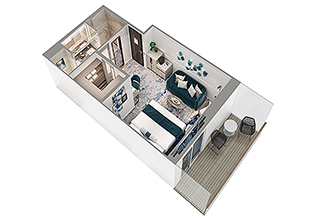 LIVE & SLEEP- Perfectly designed for ultimate comfort, your Penthouse features an inviting queen-size bed or twin beds with superior bedding, vanity and dressing area, flat-panel HD TV and direct access to private verandah. REFRESH- The master bath features a Jacuzzi, television, separate shower and bidet, Calacatta marble floors, and ocean view. The guest bath includes a shower and discreet entry. RELAX- Personalized 24-hour butler service means our staff attends to your every need, including unpacking and unpacking upon request, in-suite dining, reservations for spa, dining and shore excursions and more. LIVE & DINE- After a day of discovery and enrichment, relax in the sublime comfort of your spacious living and dining area with separate study, or enjoy an amazing ocean sunset and glass of champagne from your own private verandah. 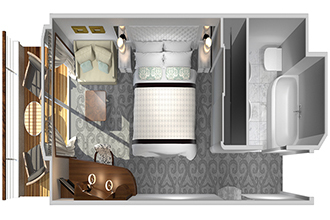 SLEEP- Your luxurious suite features a state-of-the art TV, comfortable queen-sized bed or twin beds with fine bedding and third berth, and generous walk-in closet. REFRESH- Indulge in the spa-like atmosphere of your elegant master bath, which features a full Jacuzzi tub, heated bench and floor, and luxury bath amenities including ETRO bathrobes, kimonos and slippers. RELAX- Relish the comforts of your beautifully appointed suite with 24-hour personal butler service including packing and unpacking, in-suite dining, reservations for shore excursions, spa, specialty restaurants,and more. 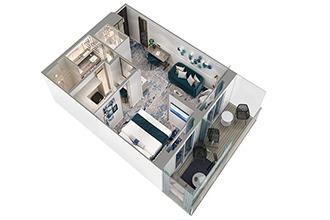 LIVE & SLEEP- The beautiful living area of the Seabreeze Penthouse includes queen-size bed or twin beds with soft bedding, vanity and walk-in closet, flat-panel HD TV, and in-suite tea or cocktails, canapes and dining from Umi Uma and Prego menus. 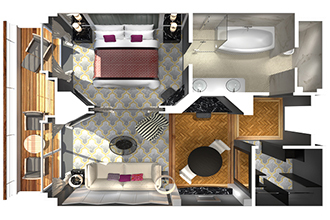 REFRESH- The luxurious double-vanity master bath features a large luxury shower with body jets, and exclusive ETRO bath and body amenities, bathrobe and slippers. RELAX- Personal butler service pampers our guests with packing and unpacking upon request, in-suite dining, reservations for spa, specialty dining and shore excursions, garment pressing, shoeshine, and more. LIVE & DINE- Invite friends for cocktails and canapés or afternoon tea served by your butler in this stylish suite, where a soothing palette of classic ocean hues and private teak verandah offer an environment of peaceful tranquility. SLEEP- Sheer relaxation epitomizes the comfort of your luxurious private bedroom that includes king-size bed or twin beds, walk-in closet, and direct access to your spacious private verandah. REFRESH- Unique touches of your indulgent, luxury bath include a large deluxe shower with body jets, exclusive ETRO bath and body amenities, bathrobe and slippers, and convenient double vanity. 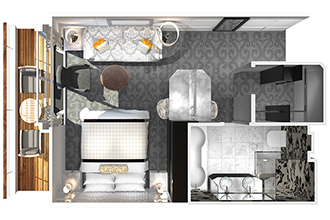 RELAX- An attentive butler anticipates your every need, catering to both you and your suite with attentive care. Services include packing and unpacking, in-suite dining, reservations for shore excursions, spa and specialty restaurants. Italian cuisine dazzles the taste buds at the Venetian-styled Prego Restaurant. The Bistro offers conventional and delicious food for those more informal occasions. 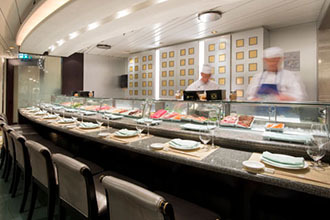 Dine on expertly prepared sushi while surrounded by shoji screens and other traditional Japanese elements. 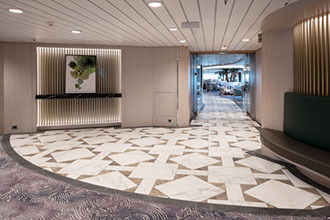 With modern food islands replacing traditionally long buffets, and a live, open kitchen, the ever-popular indoor/outdoor Lido Café is unique among cruise ships; its cream-tile floors and pale blue glass-tiled walls evoke a southern California ambiance. The Galaxy Lounge is the place to be at night. Hot Broadway shows and renowned musicians will entertain you. Come enjoy a show in the Hollywood Theater. 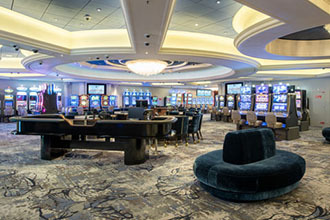 Stakes are high in the casino, where craps, blackjack, and slots rule the sea. Want to read a book? Come by and check out the collection. 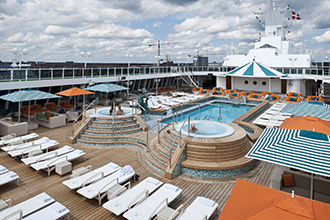 The Crystal Plaza Fountain reflects the ambiance of the entire ship: class, luxury, and pleasure. Saturday Night Fever, party like it is 1978. Ready to dance? At Stardust you can dance all night long. The pool area and deck are prime places for soaking up the sun, having a drink, and reading a book. Enjoy a game of paddle tennis on top of the ship. Designed to resemble a jewelry box, complete with a mother-of-pearl feature wall and beveled chrome vitrines, the Facets fine jewelry boutique features plush chairs upholstered in stone-colored leather allowing for a leisurely shopping experience. All the latest in exercise equipment fills the Fitness Room, where you don't have to miss one workout just because you're on vacation. Enjoy a soothing massage or one of the many luxurious amenities. Photo The Studio is home to Crystal's revolutionary Creative Learning Institute featuring progressive classes such as digital filmmaking offered in conjunction with USC's School of Cinematic Arts..
A perfect place for a cognac or other after-dinner cocktail, the Avenue Saloon is the perfect place to relax. Bartenders mix up mean martinis and a tough Tom Collins at this bar located next to the atrium. Try one of the many varieties while basting in the sun relaxing by the pool. Come by for a drink and watch the sunset at sea. Enjoy sipping on fine scotch and brandy? Come by for a treat. Spend your afternoon or evening relaxing in the luxurious Palm Court lounge.